The holiday season is upon us! We're in the middle of Hanukkah and Christmas is coming. To help you get in the spirit, today's Feel Good Friday is about Operation Santa. As explained on their website, "since 1912, postal employees, charities, individual and corporate volunteers have helped children in need experience the magic of the holidays by adopting their letters sent to Santa." The program started when Postmaster General Frank Hitchcock authorized employees to answer children's letters. It expanded in the 1940s when the volume of letters increased and charitable organizations, corporations and individuals started responding and sending gifts. Now, Operation Santa has gone digital! There are seven cities across the U.S. where you can select a letter online and then drop off gifts at a designated Post Office: DC, Pittsburgh, Indianapolis, New York, San Diego, Austin and Phoenix. If you live in one of these cities and want to participate, check out the FAQs to find out how. For people living outside of these cities, you can check the Be An Elf website to see locations of Post Offices around the country where you can stop by in person to read and adopt letters, then return to drop off gifts. If you want to write a letter from Santa to your own child and have it mailed back to you with a North Pole postmark, follow the instructions at Letters from Santa. 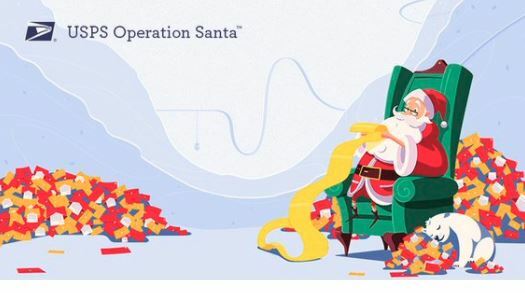 To see the results of everyone's good work and make sure you're first to know when everything gets started up next year, like the Facebook page and follow them on Twitter @OperationSanta.